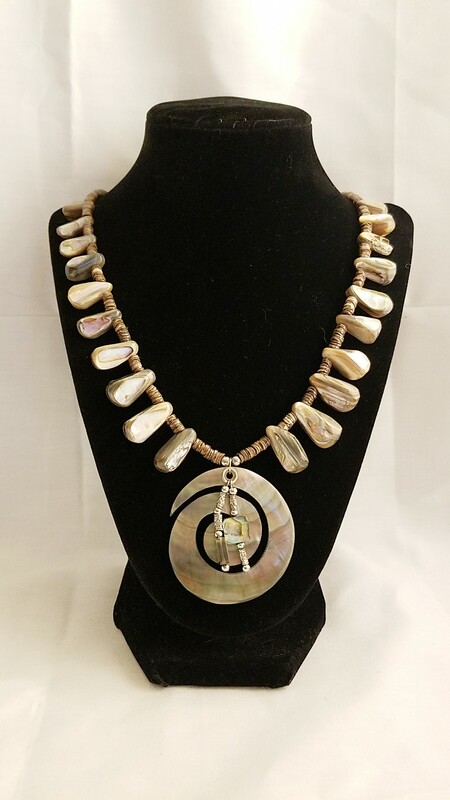 The Ocean’s Light Mother of Pearl Pendant Necklace leads way to the gorgeous colors of the ocean. A piece of Mother of Pearl Shell has been carved into an enthralling swirling oceanic pendant. It hangs between exotic pieces of Pāua shell drops and Penshell pieces making for a fascinating necklace fit for a queen. The Ocean's Light Mother of Pearl Pendant Necklace leads way to the gorgeous colors of the ocean. A piece of Mother of Pearl Shell has been carved into an enthralling swirling oceanic pendant. It hangs between exotic pieces of Pāua shell drops and Penshell pieces making for a fascinating necklace fit for a queen. 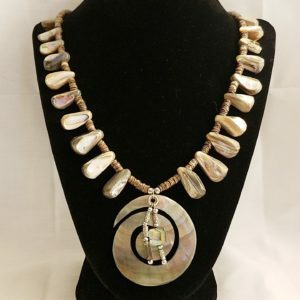 Mother of Pearl or Nacre – is an organic-inorganic composite material produced by some mollusks as an inner shell layer; it is also what makes up the outer coating of pearls. It is strong, resilient, and iridescent. 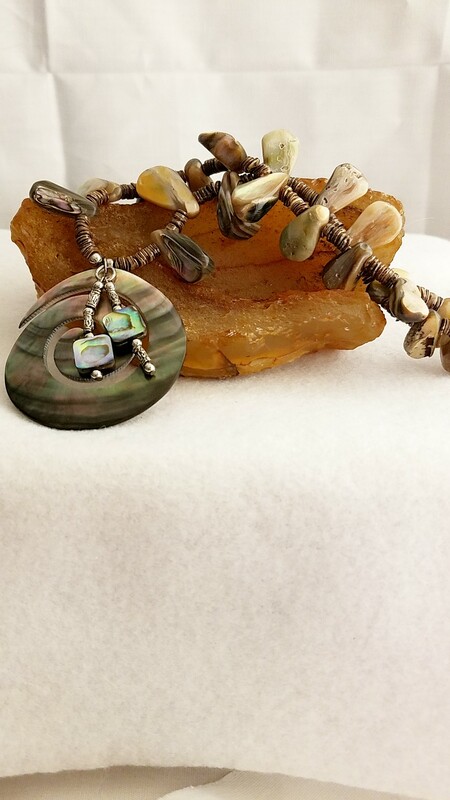 Mother of Pearl has both traditional and New Age metaphysical and healing lore. MoP is said to attract prosperity. It is used in mystical work and lore to heighten intuition, psychic sensitivity, and imagination as well as purported to protect from negative influence, and transmute negative energy. 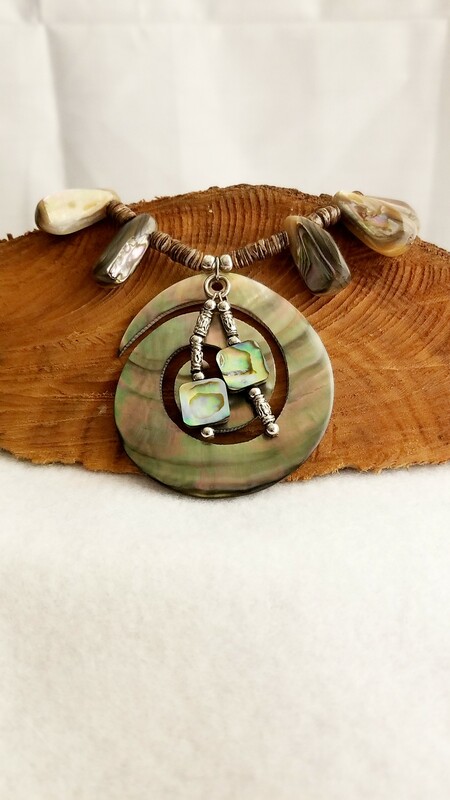 Therefore if you would like more information about the gemstones and items I use in making my handmade items like this, The Ocean's Light Mother of Pearl Pendant Necklace Materials Description Page. 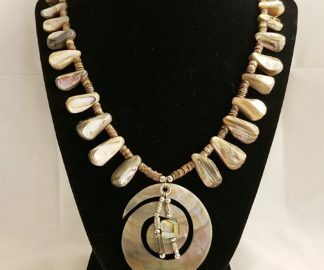 Let The Ocean's Light Mother of Pearl Pendant Necklace!